It’s definitely Summer here, in Perth. It’s been HOT and we have been swimming alot and to the beach in the last few days. When I think about what Summer means to me, I realised it’s all about the heat and beach. So I designed my card around that. The Summery colours I have used are Pear Pizzazz, Daffodil Delight, Melon Mambo & Tempting Turquoise. 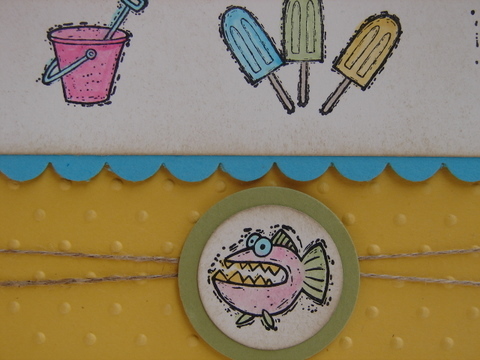 The stamp set is called Just Beachy (now retired). The Just Add Ink Design Team have made some beautiful Summery Projects too – you can check them out here. With both Day Care and Kindy this year – I had heaps of Teachers gifts to put together. Sarah has about 5 Teachers at Kindy and there are about 9 ladies at the Day Care. Then I wrapped them up with Ribbon and a Hand-cream. And Sarah wrote her name in the little card. Forty Eight Challenges!! Wow – And I have almost done them all……What a great lot of fun I have had doing them too. Some have been a real real Challenge for me….and others just happened. I hope you have enjoyed coming over (to my blog) to have a look. This weeks Challenge is a Sketch Challenge….so that means we have been given a Sketch and have made something to represent the Sketch. Here it is.. I must admit…..I left this one till the last minute….and all the idea’s I originally had for it, I did not like and they ended up in the bin. So, believe it or not – I turned to my scraps bin to try to find a pre-made image. And I did….there is was – a brayering / reflection image I had done when I was showing some ladies how to do it. So after playing around with it (a great deal) I decided it was the wrong shape……and then proceeded to start from scratch again!! Decided on a Man Card. And I had just received these Brads from a Secret Sister – so wanted to try them out. Just Add Ink #48 is open for 2 weeks (due to the Silly Season), so we hope you will find some time to play along, maybe even get some inspiration to get those last minute Christmas cards. So go check out what the Just Add Ink girls have put together for this Challenge – and then have a go yourself. Wow – you should see this!! It’s just the most awesome Christmas Card. Made by my friend Kim. It’s fantastic. I love the punch art, colours, glitter – the lot. Thank you very much Kim – I love it. 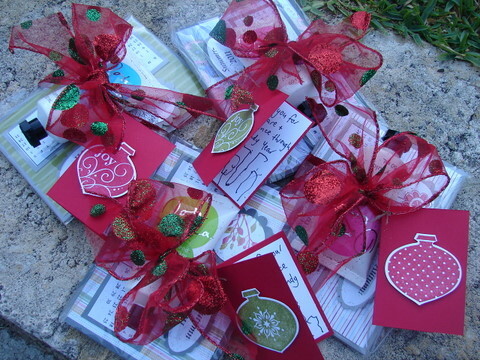 Recently the Girls at Just Add Ink got together to participate in a Card Swap. A Card Swap is where all participants make multiple copies of one card design and send them off to the rest of the group. What you end up with is a copy of everyone’s cards, but you’ve only had to design one! 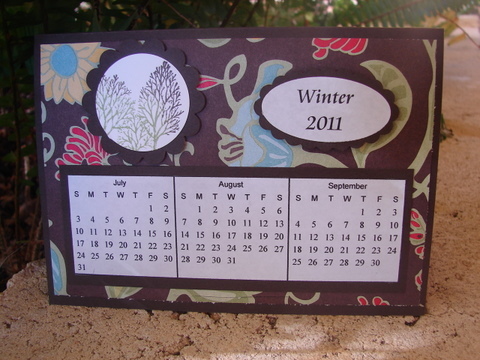 We decided on a theme which was to use products from the New 2010 – 2011 Stampin Up Catalogue. After we had all received our cards we thought it would be a great idea to show them to you…..and what better way to do it – than a Blog Hop. Here are a few details about our Swap Hop…… there are 14 stops on our Hop (Just Add Ink and each of our 13 Design Team members), but the hop is set up in a loop so it doesn’t matter where you start. All you need to do to follow along is click the Swap Hop button at the end of each post and you’ll be taken to the next stop! The great part of that is that you can do the Swap Hop whenever you want. The card I put together also has a story – because not only did I make it for the Just Add Ink Card Swap but I also did it as a part of a Swap that I was doing with my sister Nadine. And I sent it to a couple of Secret Sisters I have around the world too. This is it………. 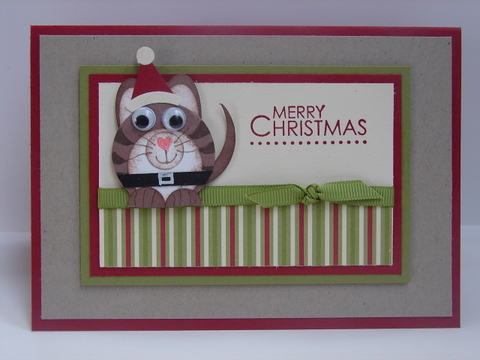 This one is the Just Add Ink Card Swap Version. 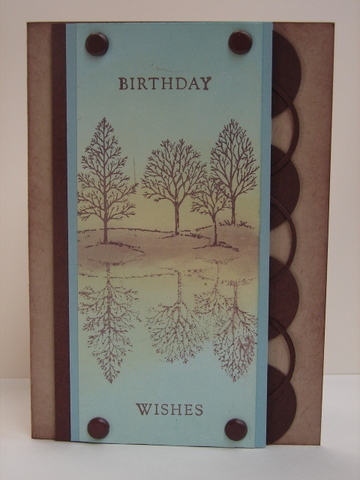 I have used Crumb Cake, Early Espresso, Pear Pizzazz and Marina Mist Cards Stock. The Stamps are Every Moment, Baroque Motifs and the Vintage Vogue Wheel. The Ribbon is the 1/8″ Taffeta Ribbon in Early Espresso. 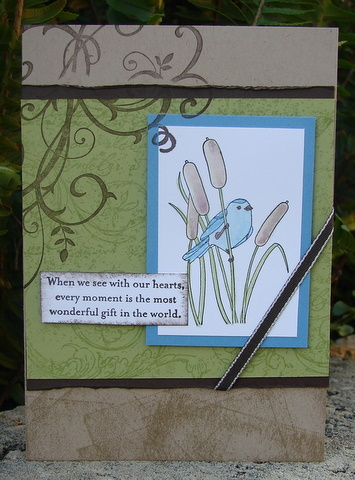 The Challenge I had with Nadine was to Create Cards using the layout of the Cards on Page 82 and 83 of the 2008-2009 Stampin Up Catalogue. Here is the Version I sent Nadine. So this came from one of the Cards on Page 82. I used So Saffron and Hemp Twine on this one. Leave me a comment to let me know what you think. I hope you have fun hopping around the Just Add Ink girls blogs. 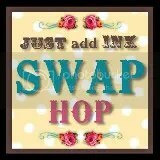 To continue on the Just Add Ink Swap Hop – Click on the button below to visit Tania. 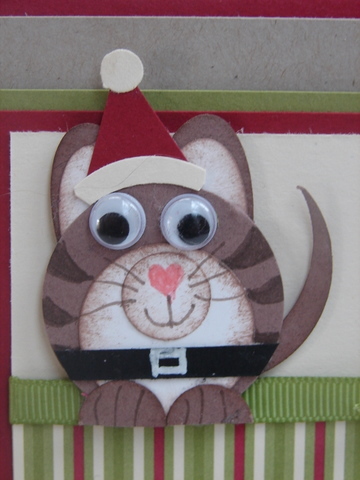 Haaaa – it’s a Christmas Santa Cat!! I did not have any Critter Stamps – so decided to make a Punch animal. Then I remember I already had this little fellow sitting on my desk – so I added his hat and belt and there you go. I’ve used Cherry Cobbler, Vanilla and Old Olive. The DSP is the Jolly Holiday papers. 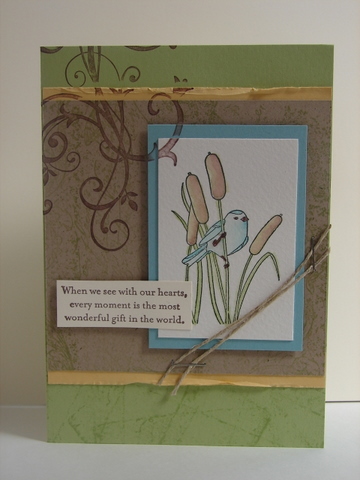 I CASED this layout from a cool Owl card that my sister made. 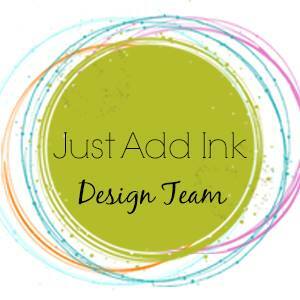 So go check out all the fab creations at Just Add Ink. And don’t forget to show us your entry too.